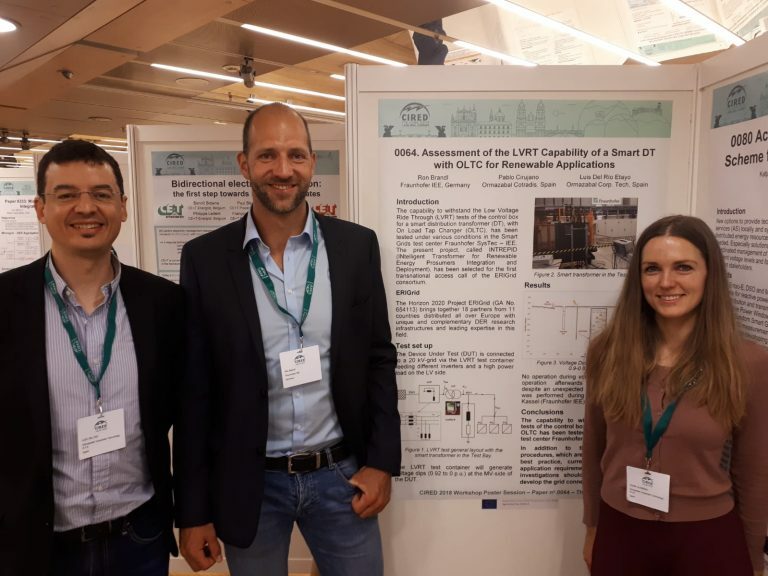 This year at the CIRED Workshop on 7-8 June in Ljubljana (SL), Luis del Rio Etayo and Alena Ulasenka from Ormazabal and Ron Brandl from Fraunhofer IEE presented the outcome of the joint research, which had been carried out in autumn 2017 within the ERIGrid Transnational Access (TA) programme. As a TA user project INTREPID (INtelligent Transformer for Renewable Energy Prosumers Integration and Deployment), the two ORMAZABAL researchers tested their smart transformer in SysTec’s Smart Grid laboratory of Fraunhofer IEE. 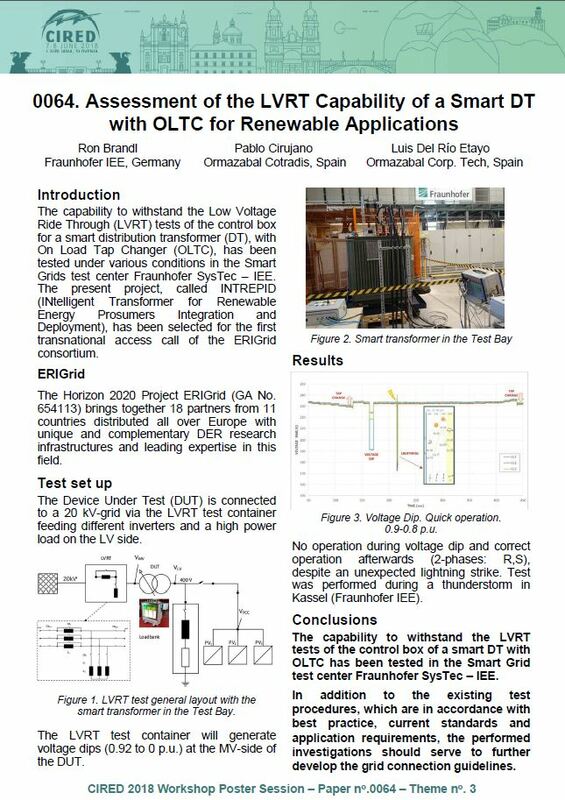 The outcomes resulted in the paper “Assessment of the LVRT Capability of a Smart Distribution Transformer with OLTC for Renewable Applications” describing the performed testing of the capability to withstand Low Voltage Ride Through tests of the control box for a smart distribution transformer with On Load Tap Changer. At the CIRED Workshop the researchers presented the poster on the publication highlighting the major findings, such as the improvement of renewable energy resource integration by active low voltage management and the robustness of a smart transformer setup due to voltage variation. The conducted work will be followed up with future research with an active centralised control of several LV energy units including PV and battery inverter combined with the tested smart transformer. All lab operation costs, travelling and accommodation expenses are paid by ERIGrid. Next call for applications opens on 15 August!